Traditional fare isn’t as apparent as on previous albums by Hilary James, a vocalist with an artistic, if not commercial parity to the disparate likes of Maddy Prior, Mari Wilson, Sonja Kristina and Ute Lemper. Indeed, mainstream pop is represented as much as Hilary’s Midlands’s folk club roots, notably in affectionate revivals of ‘All I Have To Do Is Dream’ and ‘Dream A Little Dream Of Me’. The latter is reprised via a bonus track by her ten-year-old niece – the daughter of the other figure central to this project, Janet Giraudo. Her lengthy sojourn in France has a pronounced bearing on the mining of five of the fourteen tracks from the rich seam of chanson, ranging from the 16th century Yuletide carol ‘Un Flambeau Jeanette Isabelle’ to a reinvention of the much-syndicated ‘Plaisir D’Amour’. Moreover, as it often is with musical siblings, there’s something intangible, almost telepathic, about the tone and timbre rather than the actual notes of harmonies sung, on a collection that also embraces ragtime, Vivaldi, pre-war jazz, and a setting of Christina Rossetti and John Masefield poems by the project’s eminence grise, Simon Mayor, renowned chiefly for being to the mandolin what Ravi Shankar is to the sitar. Renowned double bassist, guitarist and mando-bassist Hilary James, and her sister vocalist Janet Giraudo, who lives in France, have blended their talents to produce a wonderful set. In heir own words, ‘a pot pourri of Parisian tangos, English folk song, baroque and popular song from down the centuries’. True to their roots, English folk offers My Faithful Johnny and I Live Not Where I Love, while L’Auberge Au Crepuscule, Tout S’Efface and Plaisir D’Amour come from French/Italian singer Rina Ketty. Hilary’s partner Simon Mayor adds his vision to two English poems, and a cut glass version of the Everley’s All I Have To Do Is Dream rounds off a refined release. Hilary James and Janet Giraudo (yes, they’re true sisters!) serve up a harmonious and pleasing multilingual, multifaceted menu of Anglais/Français, folksong, pop song, ragtime, baroque and a pair of poetry settings, with sophisticated, typically polished instrumental support from Simon Mayor. An elegant, classy delight. 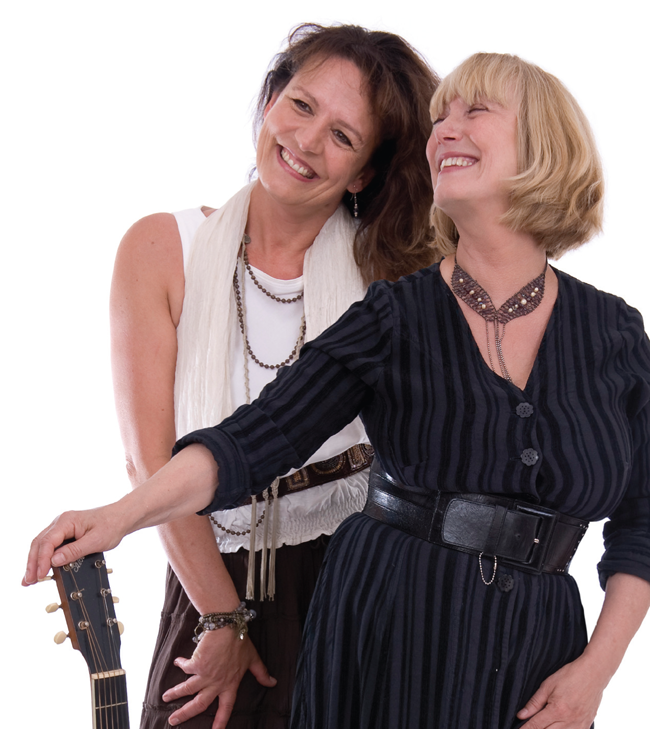 These Two Sisters, Hilary James and Janet Giraudo, turn out to be “real” sisters; we learn that Janet emigrated to France at twenty, whereas Hilary stayed behind in England and formed her fruitful and long-running partnership with Simon Mayor, who produces – and, inevitably, plays several instruments on – this record. And yes, Hilary and Janet were born to sing together, as you’ll hear on this sparkling, typically varied collection of vocal classics that seemingly effortlessly takes in any genre from folksong (I Live Not Where I Love, My Faithful Johnny), the Everly Brothers (All I Have To Do Is Dream – which turns out to be the first song the sisters ever sang together) and ragtime (Hot Time In The Old Town Tonight) to the ’30s Harry Woods standard What A Little Moonlight Can Do (long associated with Billie Holiday), the Mama Cass evergreen Dream A Little Dream Of Me (which doubles up as a bonus track spanning the generations) and the trusty baroquerie of Vivaldi’s Laudamus Te (here boasting a luxurious mando arrangement). There’s also beaucoup d’interest for hardened Francophiles, in the form of Plaisir D’ Amour, a Provençal carol (Un Flambeau, Jeanette, Isabelle) and a brilliantly aromatic Parisian tango L’Auberge Au Crepuscule. The disc is enticingly topped up with a brace of delicious setting (by Simon) of well-known poems: John Masefield’s Sea Fever and Christina Rossetti’s Lullaby. The sisters’ skill and versatility is unquestionable, their performances right across the musical spectrum genuinely harmonious, uniformly eloquent and naturally accomplished; if just occasionally their delivery might come across as a touch cultured, even sweetly understated, this doesn’t present a problem to the listener who will find the whole selection pleasingly sequenced and coordinated. What it doesn’t say is that they are wonderful. The sisters, Hilary James and Janet Giraudo, are equally at home wherever they decide to stop off in time and region. Their lilting soprano voices blend together like two rare types of coffee beans to make one delicious beverage, one that you could drink all day with pleasure and no caffeine effects. The CD is beautifully arranged to take you through a variety of moods on a trip through the best international songs of our and any other time. One four-song sequence gives us Vivaldi, followed by the Irish ballad “I Live Not Where I Love,” which leads to the French “Plaisir D’Amour” followed by the Every Brothers “Dream.” Then, as if that sequence doesn’t show enough variety, we get a ’20s-driven version of “Hot Time in the Old Town Tonight,” complete with a tuba playing the bass line. The fun that the sisters are having with this set of songs is infectious. As I listened, I found myself smiling and occasionally laughing out loud at the spirit and good humor in these tunes. Songs & Chansons is a trip through a magical musical universe. I recommend you take it. After spending 30 years apart – one in England and the other in the south of France – English-born sisters Hilary james and janet Giraudo have reunited to record their first album together, incorporating influences from both sides of the Channel. The mixture of Parisian tangos, English folk songs, baroque tunes and popular songs down the centuries, has something to please everyone. Ragtime sits alongside Vivaldi; pop classics mingle with French baroque and traditional folk melodies in this diverse and delightful album. Six years in creation, Hilary and Janet sing 14 songs (plus a bonus track from Janet’s ten year old daughter), subtly and ably supported throughout by Simon Mayor’s strings. Tracks include Plaisir D’amour, All I Have To Do Is Dream, followed by Hot Time In The Old Town Tonight and Tout S’Efface – giving a sense of the mixture of musical genres being presented. Hilary, of course, comes with a substantial reputation for her music and her art: Janet, based in France, is perhaps less well-known. Together, the sisters’ two-part harmonies predominate and blend beautifully – they are especially exquisite on Lullaby (based on the Rossetti poem) and Laudamus Te. A light touch and a sense of innocence prevail across the whole CD. The lyrics are always clearly audible and the sleeve notes offer helpful additional details. While there may be a hint of “sameness” in the sound of the songs over the whole CD, each individual track stands well on its own and is given a unique slant by Hilary and Janet. Professionally presented, Songs & Chansons is a soothing and happy blend of assorted melodies. Light on the ear and with a consistently high quality of musicianship and production, this CD is a lesson for harmony singers. In bringing together classic works which span centuries and nations, it shows how they can all be presented as “folk”. The car is a great vehicle of parental indoctrination. Play your own music a few times without comment on long journeys and, soon, routine-loving children – if small enough – will ask for it again. I remember my daughters wanting me to play a wonderful Box Fox and Stu Luckley album, Nowt So Good’ll Pass, probably in cassette form, and especially liking (and getting the regional dialect) in A Begging I Will Go. They also learned to love Chantal Goya, which naturally pleased my French wife, but that was easy since she was targeting their age group. Dream a Little Dream of Me, sung in beautifully accented English by 10-year-old Cloé, is a delightful addition, not even listed in the order or tracks I found online for Hilary James and Janet Giraudo’s charming album in French and English, Songs and Chansons: The Two Sisters. Mamie et Ta-ta are just going to have to live with that order of priorities. But the good news for grown-ups is that the official bulk of the album is an unqualified treat. No album in which Hilary is involved, from her solo work to the long-established partnership with the acclaimed mandolin, fiddle and guitar player, Simon Mayor, is ever much less than that, but this would be an excellent place to start for new listeners as well as being a must-have addition to the collections of the initiated. The story behind the album is that the sisters hail from Stoke-in-Trent, as indeed some must. There was no great musical heritage in the family. No one even belted out Delilah, the song of domestic murder curiously chosen by supporters of Stoke City as their favourite terrace ditty. The family moved to Worcestershire where Hilary would sing in the street, at school, in the bath. She and Janet began to sing together in their teens but the duo’s progress was interrupted by the lure of travel that took Janet to France, where she was remained ever since. Doubtless over carafes of rosé to wash down the olives and amuses gueules of Provence, the sisters decided it was the moment to make up for lost time. But they had to move before Janet forgot her English altogether; she even dreams in French these days and frequently struggles for the right English word. The result is this gem, exquisite harmonies and interchanging solos impeccably accompanied thanks to Simon’s inevitable input. I enjoyed both versions of Dream, but there are also memorable interpretations, which little Maya also quite likes, of a well-chosen set of songs in both languages. My own preferences are for another evocation of dreaming, All I Have To Do Is Dream, and I Live Not Where I Love, a song I remember especially from the singing of Tim Hart and Maddy Prior and later, I think, on a Steeleye album, both being founder members. Among the chansons, I was surprised to see the sisters had managed to breathe new life into Plaisir d’Amour. I could soak in L’Auberge Au Crépuscule (The Inn At Twilight), Tout S’Efface (Everything disappears) all day long. Maya wants Cloé to pop over from her part of Provence to ours, as it is for half the year, to play with her when she joins us in the summer. She doesn’t realise the gulf between five and 10, maybe 11 by now, means “playing” is something from Cloé’s past. But she joins me in giving this album 10 out of 10. And she tells me that if she had chosen the headline, it would have been another phrase from Dream A Little Dream Of Me: “still craving your kiss”. Voila! There’s a long and fascinating history to this absolutely gorgeous debut album; Hilary James (of The Mandolinquents and Slim Panatella and the Mellow Virginians) and Janet Giraudo were born in Stoke-on-Trent, and, as teenagers 30 years ago, used to pass the time singing harmonies to each other. Their first party piece was The Everly Brothers’ ‘All I Have To Do Is Dream’ – track 10 here – before Janet disappeared off to live in Provence. As the years passed, Hilary and Janet kept in touch – and the idea that they should record together was hatched. Janet was a true Provencale by now, and she contributed a clutch of classic French songs; and the CD is a magic pot-pourri of folk songs, chansons, opera, poems, 1930s jazz and pop from yesterday, spiced with stunning, beautiful angel voices in heart-stopping harmony. Hilary’s long-term partner, Simon Mayor, produced the whole project and overdubbed guitar, violin, mandolin and several other instruments, while Hilary contributed guitar, double-bass and mandobass – an impressive cross-bred bass mandolin. The only musician is Simon Price on percussion. All the songs are sources of wonderment, enhanced by Simon’s arrangements. Hilary and Janet’s ethereal sopranos add a touch of brilliance to John Masefield’s ‘Sea Fever’, the tango ‘L’Auberge Au Crépuscule’ and the evergreen ‘Dream A Little Dream Of Me,’ while Vivaldi’s ‘Laudamus Te’ just can’t be beat for Simon’s inspiring mandolin scoring. The Provencal childrens’ carol ‘Un Flambeau, Jeanette, Isabelle’, the baroque ‘Que Ne Suis-Je La Fougère’, Rina Kerry’s ‘Plaisir D’Amour’ and the graceful ‘Tout S’Efface’ add to the appetising French flavour, while ‘I Live Not Where I Love’ and the lovely Scottish song ‘My Faithful Johnny’ restore the balance. Although Janet and Hilary live almost 1,000 miles apart, let’s hope that this album isn’t a one-off. Many artists attempt this sort of melange of styles and sources but few do it with the panache of Hilary James and Simon Mayor. The titular sisters are Hilary and Janet Giraudo but Simon must be mentioned sooner rather than later simply because he’s the whole of the orchestra with Hilary’s guitar and bass and a little added percussion from Simon Price. The album opens with John Masefield’s ‘Sea Fever’ in a new setting by Mayor followed by the 30s hit ‘What A Little Moonlight Can Do’ in sparkling ragtime style. Next comes ‘Auberge Au Crépuscule’, a French tango from the same period. Janet has lived in Provence for many years and both sisters sing in French like natives. From here the net is cast even wider. ‘Dream A Little Dream Of Me’ is followed by a French baroque song, an excerpt from Vivaldi’s Gloria and a traditional English song. The ragtime classic ‘Hot Time In The Old Time Tonight’ follows ‘All I Have To Do Is Dream’ and the record finishes with a Provençal carol and another English traditional song, ‘My Faithful Johnny’ collected from a Singing Together book – hands up if you remember those! Actually, there is a bonus track but I’m not going there. Some might find this all a bit sweet, maybe even a touch twee, and in less capable hands I might agree but you have to consider the élan and the pleasure with which it’s done. The arrangements (by Mayor) are detailed without being overwhelming – there’s a delightful violin solo on ‘I Live Not Where I Love’, for example, which keeps the melody intact but teases with classical hints. Songs & Chansons is an album for listening in the garden with a pitcher of Pimms and the petits fours to hand.